It’s that time of year again- it’s fall consignment sale season! Every night this week I’ve sat down with a pile of tags and some safety pins and have tagged away at the inventory I’m selling this year. 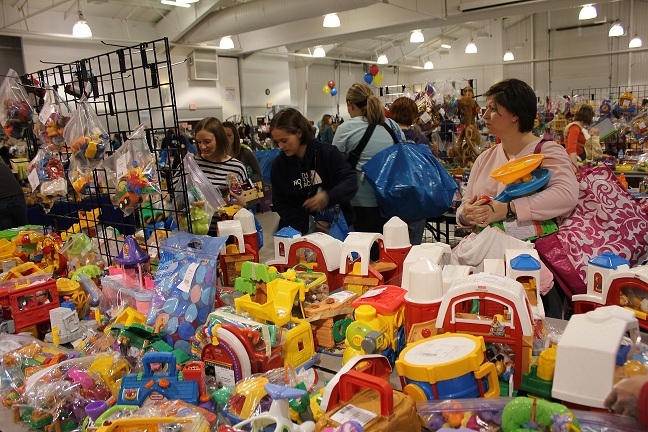 The annual Indy Kids Consignment Fall sale is happening next week, with the pre-sale happening on Wednesday, September 10th, and then the actual sale happening on September 11-13. Even though it’s 98 degrees out right now, the time for long pants and boots will be here before you know it. I’ve consigned with IKC for several years now, and I always shop the pre-sale. Getting to the sale as early as you possibly can is crucial to getting the best inventory, I’ve purchased winter coats, shoes, boots and so much more at these sales. Wondering what else might be in stock? Check out my article on FunCityFinder for all of the details. 1) Wear comfortable shoes, and don’t bring in anything extra. There are no shopping carts, so you many want to bring a tote bag or even a hamper on wheels. You may want to wear a cross-body bag or (gasp!) a fanny pack. Basically, you want your hands free, because you’ll need them. 2) Make a note of your kids’ sizes. Yes, they’ll hate you for it, but you have to know. Haven’t had your kid measured for shoes lately? Trace the outline of his foot on the back of your shopping list to use as a guide. 3) Speaking of a shopping list….make one. I always go through what my kids have, and then make a list from there. 4) Set aside an adequate amount of time to shop. The showroom is HUGE. If you’ve never been, it’s hard to even picture. It takes time to go through the different areas of the sale, it takes time to use a sorting table to make final decisions, and it takes time to get through the checkout. It’s much more enjoyable if you’ve given yourself a minimum of an hour, if not two. 5) Bring a friend! Because, obviously. It’s an invasion of Little People! Toys sell fast at every sale. Enter to win a pair of pre-sale passes for 6:30pm on Wednesday, September 10th. To enter, leave a comment and tell me what’s on your shopping list this year. For additional entries, tweet about this giveaway, linking back to this post- look-all the work’s done for you! After you tweet, leave a comment telling me that you did. For another additional entry, share this post on Facebook and leave a comment here telling me that you did. This giveaway will be open through noon on Monday, September 8th, and the winner will have 24 hours to respond. If there’s no response, another winner will be selected. I always head straight for the shoes. Boys are SO rough on shoes, so I feel like having a few extra play shoes around is never a bad thing. I will be looking for thin long sleeved shirts and hoodies. My son is a sweaty boy so normal “warm” stuff is too hot! I’m sharing on fb because pre-sale passes are like gold!! I will be in the hunt for winter and fall clothes for my one year old and winter clothes for my lo due in jan as all the NB and 0-3 I have are summer! My best friend and I love this sale! I will be shopping fall/winter clothes for my tiny 2 year old (9-12 mo leggings and adorable little tops and dresses 12-18 mos). I will also be checking out the newborn baby gear for our bundle arriving in January! As a kindergarten teacher I can never pass up all of the great prices on books for my kiddos at home and at school! It would be my first time at this sale! I will be buying boy clothes as I am expecting baby #3!!! Thanks for the opportunity! Books, Barbies, Frozen anything!! And 3T winter clothes. I’m searching for a train table and tracks for my son and a bouncer for the new baby due in October! I also just shared this on Facebook. Woo hoo! All things girl! Expecting our 5 child Christmas Day and I am totally unprepared. We must have new snow pants!